If you ask a Fort Collins commercial roofing specialist, you’ll find there are literally dozens of different types of roofing materials and even more types of actual products that retailers and contractors typically use. However, out of all these products, only a few distinct varieties are known in detail, and most are rarely if ever mentioned unless a special project might require them. 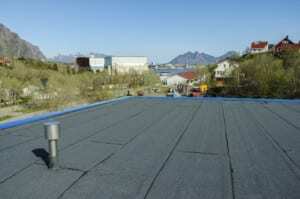 When it comes to materials used especially for low-slope or flat commercial roofs, Ethylene propylene diene monomer (EPDM) roofing is one of the first materials we should consider. This is one of the most inexpensive products used for commercial projects, and it can reach a life expectancy of more than 20 years. TPO has also become an extremely popular option among building owners, especially because of its price, but also because its white color helps reflect sunlight and can be an excellent solution in extremely warm areas. TPO commercial roofing is also extremely light and durable, offering even more protection than most EPDM products, but at a similar price. PVC membrane roofing is also worth mentioning as one of the top most durable and efficient types of materials used for flat commercial roofing projects. PVC, or polyvinyl chloride, features polyester as a reinforcement set between its layers, and the durability and resilience of PVC over time is even more impressive than that of TPO roofing, in some instances.